Kai Havertz (l.) celebrated his first competitive goal of the season before scoring three more. 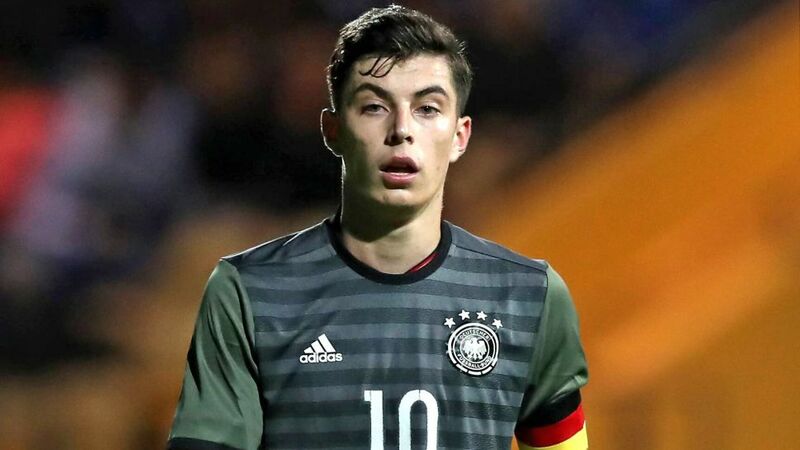 Eighteen-year-old Kai Havertz broke onto the club scene last season with Bayer Leverkusen and is now tearing up the international stage, after he captained, assisted and scored four times for the Germany U19 team. In his first competitive appearance for the U19 side, Havertz stole the show in Germany’s opening European championship qualifier against Belarus. He scored in the 17th, 57th, 64th and 90th minute, two of which came from the penalty spot, as well as assisting Hertha Berlin's Arne Maier to score the fourth goal of the game. Havertz also scored in a friendly for the U19 national team against England last month. Havertz has made four appearances for Leverkusen so far this season, after scoring four goals and six assists in 24 appearances in 2016/17, all whist completing his final school exams. Click here for more Bayer Leverkusen features and news!